Posted here are some of the photos taken by me, when fiancée Carol and I visited the New York World's Fair in August 1965. 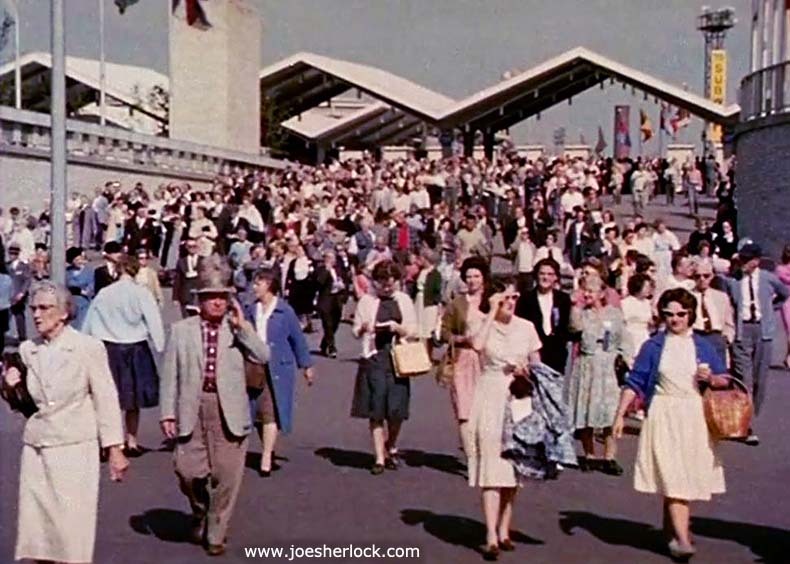 We were just two of over 51 million people who attended the Fair. 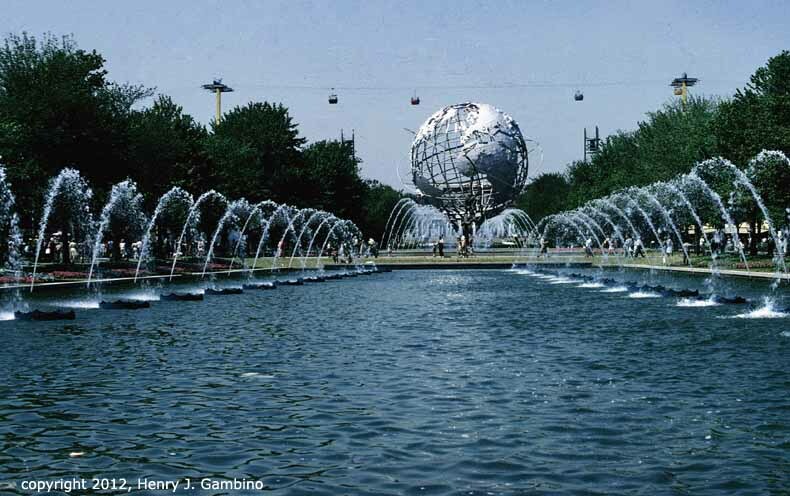 The Fair consisted of 140 pavilions located on 646 acres in Flushing Meadow, New York in Queens - the same site used for the 1939 World's Fair. 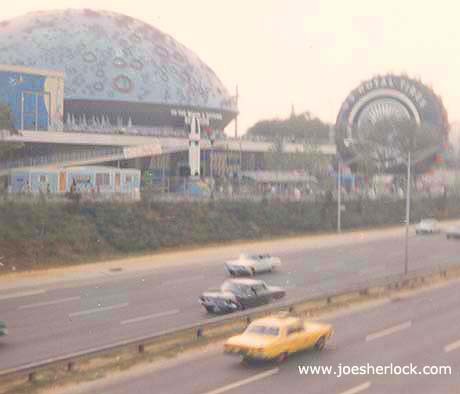 It ran from April, 1964 to October, 1965 (although closed during the winter months). There were 21 state pavilions and 36 foreign pavilions. Accessible by the NYC subway system, the fair featured a monorail, a Swiss Sky Ride, 'It's A Small World', which was later bought by Disney and moved to California, and Michaelangelo's sculpture, 'Pieta' (in the Vatican Pavilion). 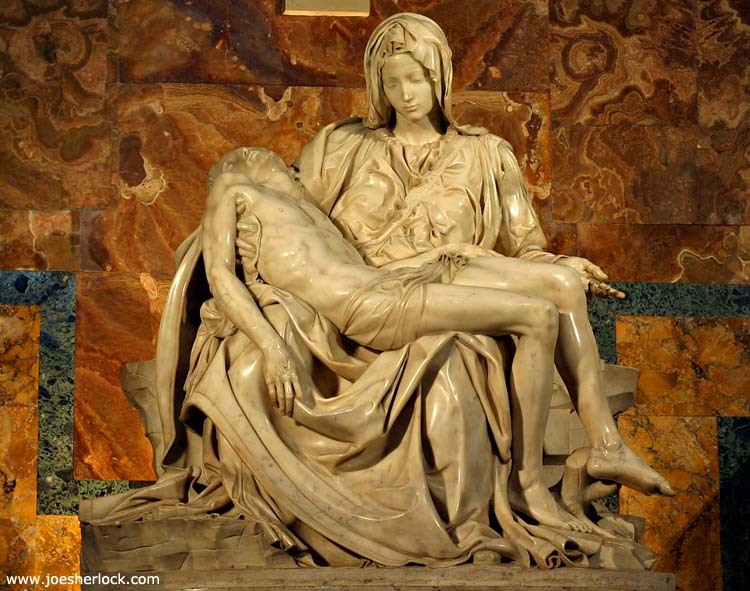 This was the first time that the Pieta had left Vatican City since its completion in 1499. Fearful that the slightest jar might split the aged marble of the massive sculpture, shippers carefully packed the statue in a water-tight case inside of a second case which was inside of a third case. Even if the Italian Line's Cristoforo Colombo - the ship that carried the masterpiece from Italy - had sunk, the container would have floated. The top of the outer container was painted a bright orange, so it could be spotted easily. We saw the statue again in 2002 during our trip to Italy. 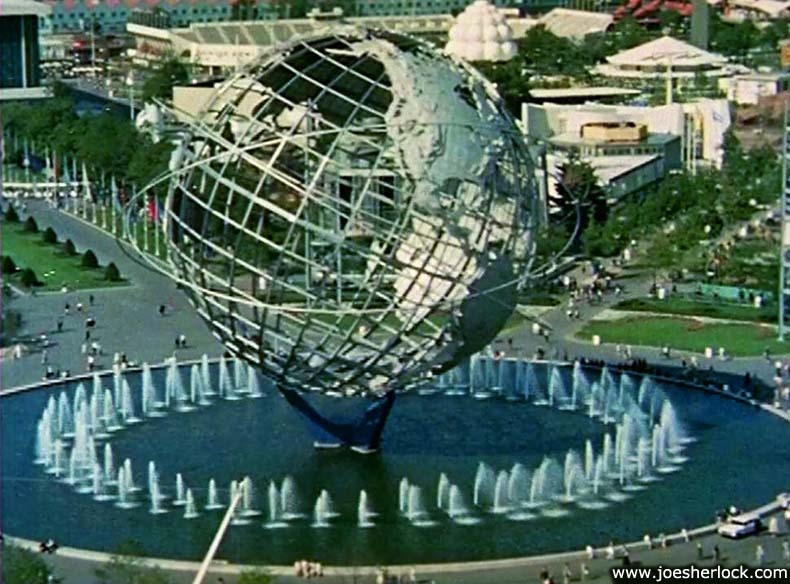 The Unisphere was official symbol of the '64 World's Fair. The fair opens; crowds rush in. This Sinclair Tyrannosaurus Rex appears to be eating the giant U.S. Royal tire but it's just a clever photo angle. Mr. T. Rex and his dino-buddies were hand-sculpted in fiberglass as part of Sinclair Oil Company's exhibit, Dinoland. 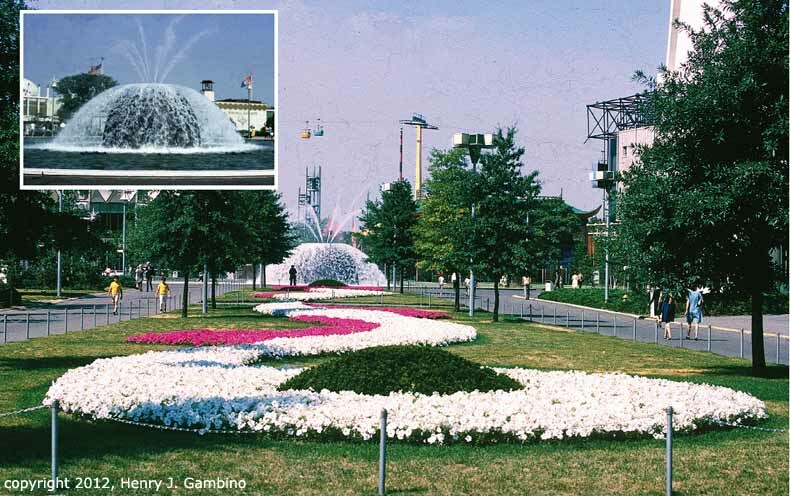 The Fair was full of fountains and artificial lakes. Carol poses by still another water feature. 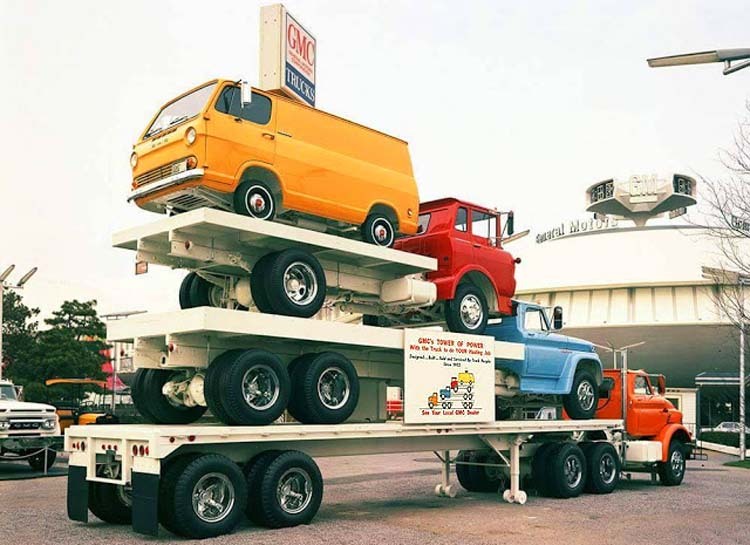 General Motors displayed a stack-O-trucks. 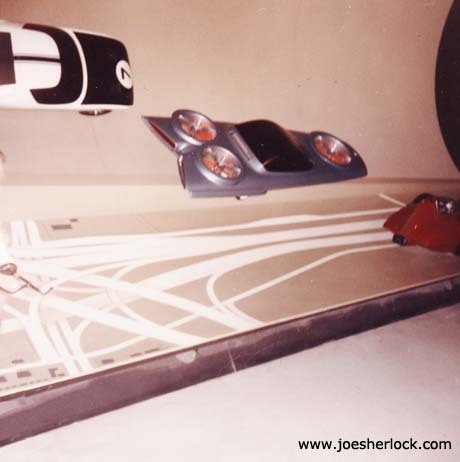 General Motors Futurama was a very surrealistic pavilion design. The exhibit provided a glimpse into the future with a scale-model city. 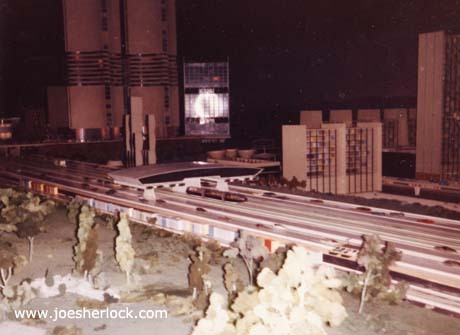 It featured giant glass skyscrapers and 16-lane highways where little scale cars zoomed along at over 100 mph. 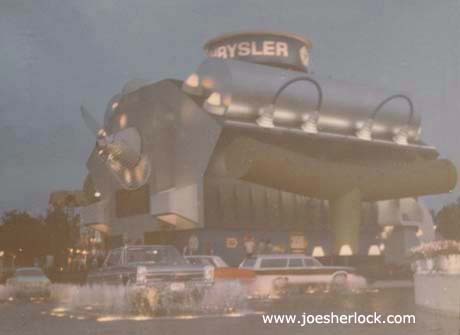 Chrysler Corporation pulled out all the stops - in addition to this large building in the shape of a V-8 engine, they had a four-story building shaped like a giant car. On display as well was the Chrysler Turbine Car. 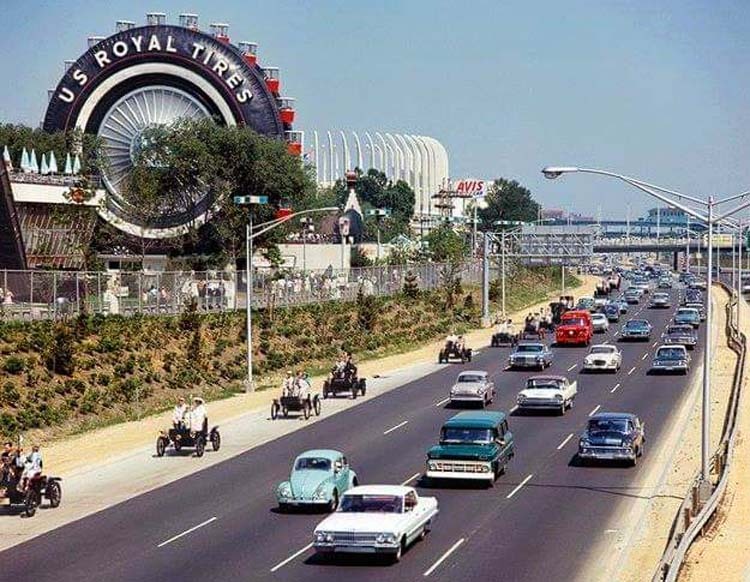 The U.S. Royal tire was a seven-story-tall Ferris wheel clad with the fiberglass skin of a huge whitewall tire. It was large enough to be seen from outside the fair as the photo at right shows. After the Fair closed, the giant tire was moved from this location to Detroit, where it was installed near Uniroyal's offices near I-75. It wasn't a Ferris wheel anymore, though - just a sign. The Grand Central Parkway ran through the middle of the fair. Behind the Parkway the Moon Dome, inside of which a color motion picture was projected on a concave screen that encircled the audience. The 18-minute film took viewers from the infinite reaches of outer space into the infinitesimal nucleus of the atom. The Uniroyal tire is on the right. 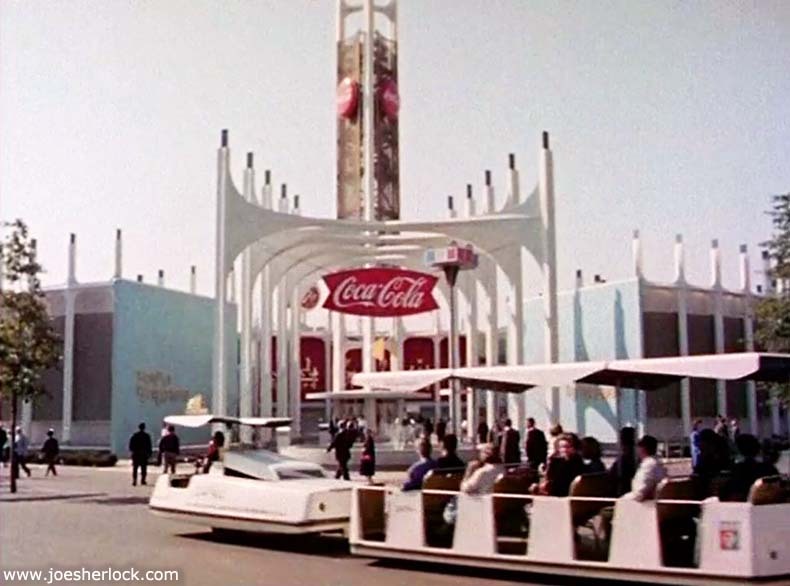 Looping around the outside of the Ford Pavilion was the Magic Skyway. 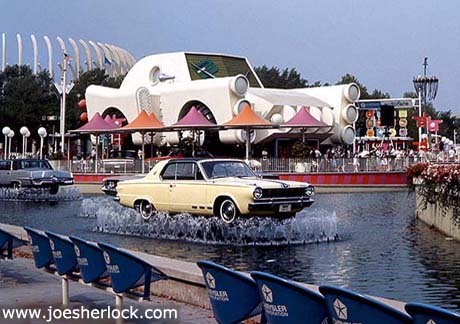 Seated in convertibles, fairgoers were first taken for a ride through clear glazed tunnels around the outside of the rotunda for a sweeping view of the grounds, then on to the exhibit building and the fantasyland within. 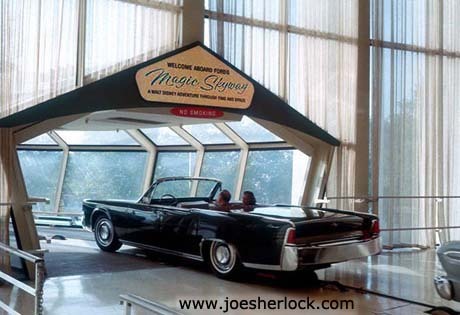 A Lincoln Continental convertible enters the Skyway. Behind it is a Ford Falcon. The ride eventually took riders on a trip back in time. A hidden 8-track player in the trunk provided the narration, which was available in several languages that could be selected by pushing buttons on the car's radio. Chrysler Styling Island included a cartoonish, 20-foot tall car. Around it was an exhibit area which exhibited current Chrysler Corp. autos. A blue Imperial and yellow Dodge Dart can be seen in the photo. 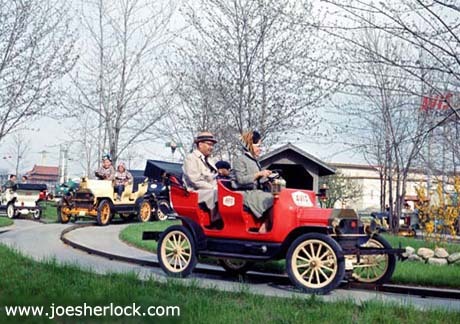 The Avis Car Ride featured open-topped antique cars, reproduced to five-eighths scale, riding along a pleasant, tree-lined 1/4 mile track in an old-fashioned country setting. Each car seated up to five people. Chrysler provided vehicles - mostly '64 Dodge models when we visited - for the one-hour Hell Drivers Auto Thrill Show at the Fair. 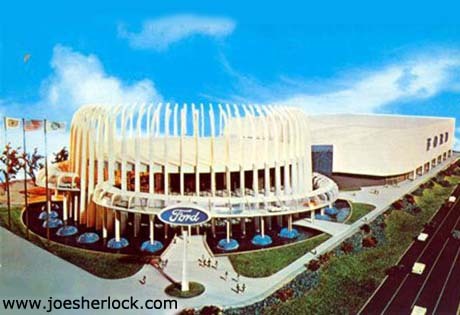 The 6,000-seat Auto Thrill Stadium featured a banked figure-eight track and could seat 6,000. Being young and impoverished, we stayed in budget accommodations and took subways to and from the Fair. 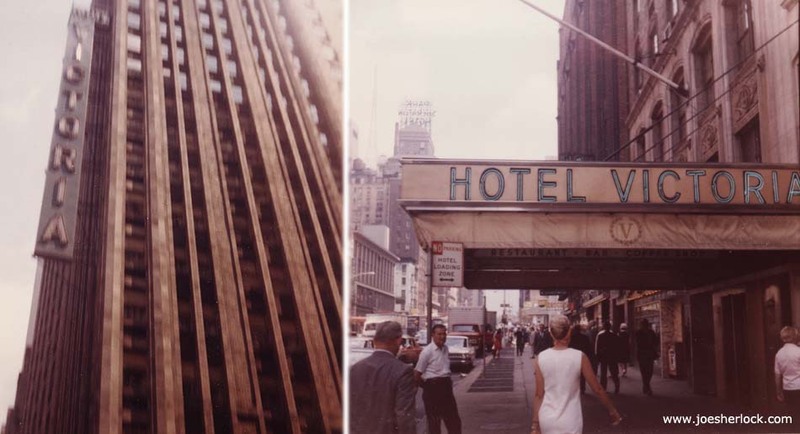 The Hotel Victoria was an aging 22-story establishment at West 51st Street and Seventh Avenue in New York City. The old girl opened its doors for business in 1928 and was demolished in 1985.